There were 45 reported criminal incidents in Miami Springs in November or flat compared to the prior month. On November 26th, there was a reported incident of armed car jacking that occurred on the 3900 Block of NW South River Drive on the eastern edge of Miami Springs. The incident occurred at 1pm in the middle of the day. There were five reported incidents of assault in November matching the average of the last 5 months. There was one incident of aggravated assault with a deadly weapon that occurred near LeJeune and NW 36th street. There were 3 reported incidents of Breaking and Entering last month. Down 57% from the 7 Breaking and Entering incidents that had occurred in October. There was only one case of a residential breaking and entering case in November (caught on video below). In October, there had been 3 incidents of residential breaking and entering. David Ovalle, a resident at 32 Hammond Drive in Miami Springs, Florida, shared this video showing an alleged burglary at his home. The video depicts a white Ford F-150 regular cab with long bed work truck that initially drives by the home. Then the vehicle stops at the driveway. The driver gets out and heads to the front door. Then the driver goes around the side of the home. The next clip shows the driver positioning his truck to block the view of the front door. Then it shows the driver entering the home and then exiting the home with a TV set and placing it in the truck. Finally it shows the driver leaving the residence. Vehicular Burglaries continue to be the most common form of reported crime in Miami Springs. November had 24 incidents or up 33% compared to October. In fact, November had the highest number of vehicle break-ins of the last 5 months. 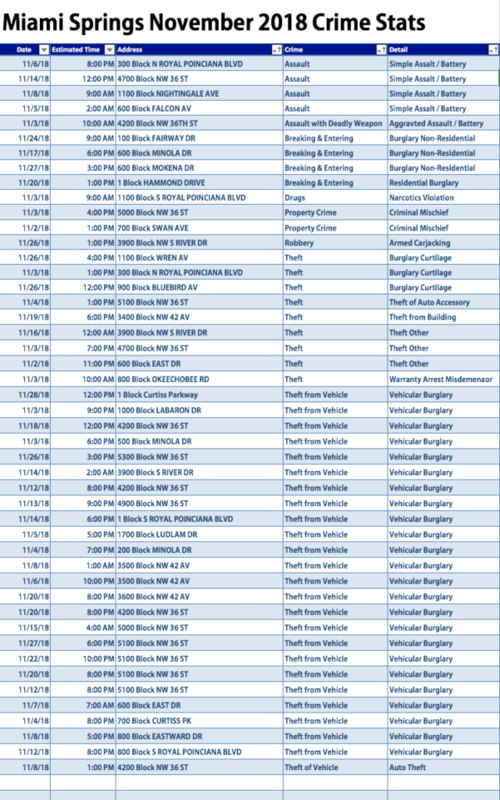 Ten of the incidents, or 42% of all the vehicle break-ins occurred along NW 36th street. Another three incidents occurred along LeJeune Road. Only one vehicle was reported stolen during the month of November marking the lowest number of vehicle thefts over the last 5 months.